Covering the modern era of the classic Colorforms Space Aliens action figures. Presented in association with 16bit.com. Not an official site. Visit TheOuterSpaceMen.com for more. 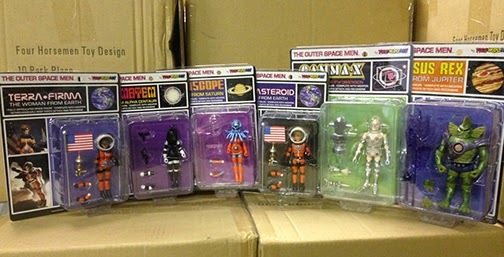 According to Source Horsemen, the (as far as we know) final sextet of Outer Space Men are in the USA now! They'll start to ship next week, so says the blog post. (Hopefully they'll be in the same box as my Power Lords and Scratch & Dent figures - I can't wait!) This means they're actually a bit ahead of schedule, which is always wonderful. New orders are open at Store Horsemen, but pre-orders will ship first. Adam Pawlus has written about Star Wars action figures, toys, and collectibles on the web since 1995. He has worked for a variety of magazines and websites and presently works as a Toy Evangelist / Buyer for Entertainment Earth. He also loves Jolt. Travel theme. Theme images by rajareddychadive. Powered by Blogger.